The S4 family are self-contained current measuring sensors enclosing all necessary solid state electronics for acquiring, processing and outputting data. Data retrieval is accomplished through a serial port without opening the instrument. The spherical shape of the S4 is a contributing factor in the rejection of the vertical components of water movement and there are no protruding parts or sensor support structures to interfere with the water flow. The S4 measures the magnitude and direction of the horizontal current motion of the water. Water flows through the electromagnetic field created by the instrument, thereby producing a voltage which is proportional to the magnitude of the water velocity past the sensor. This voltage is then sensed by two pairs of titanium electrodes located symmetrically on the equator of the spherical housing which forms the sensor. Manufacturer's specifications: Meter (sphere, diameter 25cm) is designed for depths down to 1000m (S4 standard: glass-filled cycloaliphalic epoxy construction with grooved surface for hydrodynamic stability) or down to 6000m (S4D, deep: annealed borosilicate glass version with smooth surface). The meter is shackled directly into the mooring cable by means of an axial titanium load bearing shaft. Electromagnetic, 2 axis current speed sensor, range 0 to 350cm/s (standard) 0 to 50 and 0 to 100cm/s (optional), resolution 0.2cm/s (standard) 0.03cm/s (0 to 50 range) 0.06cm/s (0 to 100 range), accuracy 2 per cent reading +/- 1cm/s. The sensor responds to the component of flow normal to its vertical axis. Flux-gate magnetometer compass for heading information used to reference the current direction to magnetic north, compass range 360°, resolution 0.5°, accuracy 2°, tilt +/- 25° for specified accuracy. Temperature stable quartz oscillator clock, accuracy 12 minutes/year. Optional automatic tilt compensation i.e. the allowable tilt of the meter from the vertical at which the vertical cosine response is fully corrected, angle range +/- 45°, resolution 0.6°, accuracy (speed correction) 1 per cent (angle output) 0.25°. Optional semiconductor (thermistor or platinum) temperature sensor, range -5 to +45 °C, resolution 0.05 °C, accuracy 0.2 °C, response time at 63 per cent 1 min (1.5 sec thermistor or 60msec platinum). Optional conductive conductivity sensor, range 5 to 70mS/cm, resolution 0.1mS/cm, accuracy 0.2mS/cm (optional inductive sensor, range 1 to 70mS/cm). Optional semiconductor strain gauge pressure sensor, range 0 to 1000dBar (70M option), resolution 1dBar (4mm with 70M option), accuracy 0.25 per cent fs. Recorder, CMOS static RAM microprocessor, 64KByte (128K or 256KByte optional) performs vector averaging, burst sampling and adaptive sampling. S4RT Basic S4 current meter without memory installed, for real-time monitoring applications only. S4 The basic S4 current measuring instrument, with current speed and direction sensors and internal memory from 64K to 1 megabyte of solid-state memory. S4DW S4 current meter directional wave measuring instrument. Includes 1 megabyte of memory, 70 meter high-resolution depth, adaptive sampling, and Lithium battery pack, standard. S4P S4 instrument outfitted for profiling applications. Fitted with fast response Platinum temperature sensor, inductive flow- through conductivity sensor, and high-resolution depth sensor as standard. Memory size may be from 64K to 1 megabyte. S4D Deep water S4 instrument for use to depths of 6,000 meters. S4A Advanced current measuring instrument with large memory capacity, and dual-mode logging capability. Memory size may be 32-256 megabytes. Includes high speed binary down-loads using Zmodem protocol with 32 bit CRC error checking. Adaptive current sampling is standard on this instrument. S4ADW Large memory capacity S4 directional wave measuring instrument. Includes 32 to 256 megabyte memory, 70 meter high-resolution depth sensor, and Lithium battery pack, standard. S4ADW-i New generation of S4ADW directional wave measuring instrument providing internally-processed directional wave data for direct output from the instrument without the need for external analysis software. Ideal multi-purpose oceanographic instrument for integrated-system applications requiring pre-processed output directly into a datalogger, PLC, modem, or other external device without need for PC computer. Used for directional wave, current, and tide measurements, with additional parameters available. Includes long-life lithium battery, and internal memory sizes from 32MB to 256MB. S4AP An S4A instrument outfitted for profiling applications. Fitted with fast response Platinum temperature sensor, inductive flow-through conductivity sensor, and high- resolution depth sensor, standard. Memory size may be 32-256 megabytes. S4AD Deep water S4A instrument for use to depths of 6,000 meters. Has all the same features and options as available with the standard S4A. S4AH Same as S4A but uses 5 Hz sampling rate instead of 2 Hz. S4AHDW, S4AHP, S4AHD are 5 Hz models of the units listed above. Further details are available from the manufacturer's specification sheet. The recorder of this instrument was set to burst mode sampling with a sampling rate of 1 second for 10 minutes every hour. This data series only contains the 10-minute average of the burst data (vector average of 1200 half seconds). Data processing was carried out at the Proudman Oceanographic Laboratory, Merseyside, UK. The time channel has been adjusted to take into account the averaging period, by adding half the sampling interval to the recorded scan time. The current data have been corrected for a magnetic deviation of 4.7° W.
This mooring was also known within PROVESS as 'Rig E'. It was one of a cluster of moorings deployed at the main focus of the Northern North Sea Site in the autumn of 1998. The rig was deployed by FS Valdivia (cruise #174) in September 1998 and recovered by RRS Challenger (cruise #140) in October/November 1998. J-rig with 6' toroid surface buoy, mid water-column 100 kg ballast and 500 kg anchor clumps. Nineteen mooring packages were deployed at PROVESS Northern North Sea site during the cruise Valdivia VA174 in September 1998. The layout of the mooring assemblage was L-shaped. 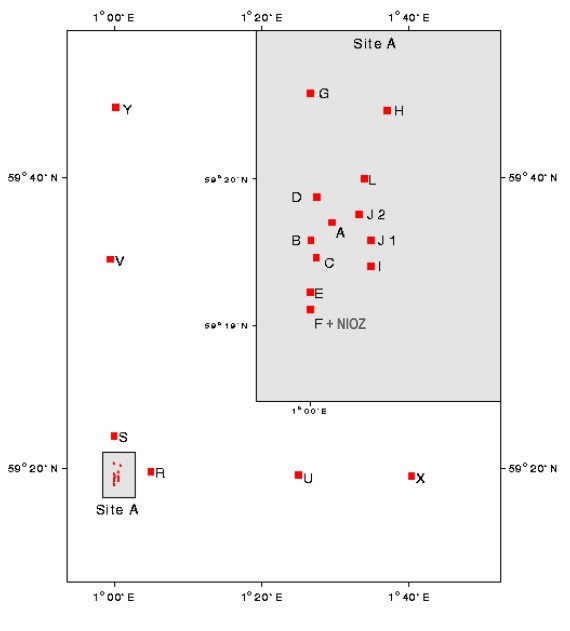 It consisted of an heavily-instrumented site centred close to 59° 20' N, 1° 00'E (Site A with rigs A, B, Ca/b, D, E, Fa/b, G, H, I, J1, J2 and L) and secondary single-rig sites extending up to 40 km north (V and Y) and east (U and X). An addition mooring package, NIOZ or Rig M, was also deployed at Site A during the RV Pelagia PE125 cruise in October 1998. Rigs Ca/b and Fa/b were two short-term rigs which were recovered at the end of the cruise VA174 and redeployed during the cruise Challenger CH140 in October. All the other rigs were recovered during the cruise CH140 in October-November 1998 apart from rigs H and L which could not be found and rig Cb which was trawled and recovered from Peterhead (Scotland). Complementary meteorological and sea state data for PROVESS Northern North Sea Experiment were obtained from Marine Weather Stations located on Beryl and Frigg oil platforms in the Northern North Sea.